Our audiology services include comprehensive hearing loss analysis, rehabilitation & hearing aids for adults and children. 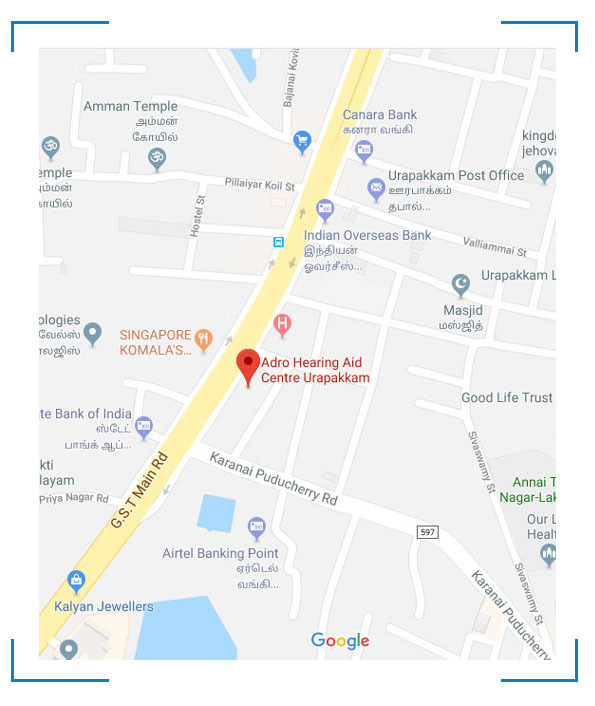 Located in outskirts of Chennai, our Hearing aid centre in Urapakkam proudly serves Chengalpattu, Kanchipuram, Vandalur, Sriperumbudur, Maraimalai Nagar, Perungalathur, Siruseri, Kattankulathur, Guduvanchery and surrounding regions in Urapakkam with advanced hearing test labs engulfing recent technologies. Hearing aid users and new patients residing in these areas can request for house trial. We care for patients as our own family member and strive to treat them with best possible hearing solutions. If our intention is to make money we would have been in heart of Chennai city, whereas service being our mission; we chose to serve the farthest community longing for nearby hearing and speech care solutions. Hearing aid centre in Urapakkam takes pride to serve its neighboring community. Our Audiologists in Urpakkam are way different as they take sufficient time to understand patients exact hearing issues and find out perfect hearing aid and have it tailored to suffice their needs.